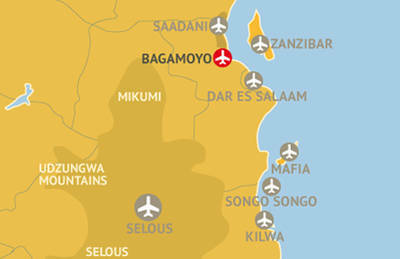 Bagamoyo is situated 80 km north of Dar es Salaam. Several times a day, buses go between Dar es Salaam and Bagamoyo. The bus stop in Dar es Salaam is in the town center. An alternative is to rent a car from Dar to Bagamoyo (tip: Makupa taxi) or to use the transfer service of the hotels in Bagamoyo provide (available only after pre-ordering a hotel room). There are plans of taking up a ferry service between Zanzibar and Bagamoyo, but first Bagamoyo needs a new ferry pier in the south of Bagamoyo near Kaole. Transfer by "dhow" (traditional sailing boat) is not permitted for foreigners at the moment. Since 2003 the street between Dar es Salaam and Bagamoyo is rebuilt by EU funds. The drive takes about 45 minutes (at night, on sunday) or 2 1/2 hours (rushhour Dar es salaam). From Kilimanjaro: Highway B1 to Usambara Mountains / Highway A 14 to Msata / Road from Msata to Bagamoyo. There is a road from Bagamoyo to Saadani National Park (4 wheel during rain season).